Alt for Norge (All for Norway) is a reality program that pits 10 Americans of Norwegian heritage against one another for a prize of $50,000 and a chance to meet their Norwegian relatives. The episodes have been airing at Merlin’s Rest Pub on Lake street. Twin Cities performer and Völva, Kari Tauring, was a contestant on this show. There is one word that describes this episode – disturbing. This is not a spoiler, it’s well known that this was the last episode that Kari Tauring was a part of. So I was prepared to feel a bit sad. I’ve enjoyed watching the program and having Kari tell us the inside scoop on how real the show was and what the contestants were like as people so I was looking forward to another pleasant evening at Merlin’s rest. What I was unprepared for was the disgust I would feel throughout this episode. I felt bad for Kari, not because she got the boot, but because of what she experienced in this episode and yet still had to keep smiling. 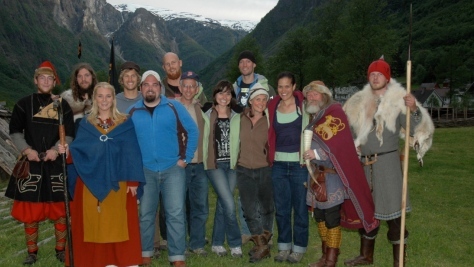 Cast of episode 4 with Viking villagers. Kari is 4th from the left and Seidman Anders is on the far left. Kari’s team lost the race, due in part to their boat being much larger than the other boat and one of their oars cracking. So Kari and her teammates would need to face an individual elimination contest the next day. That evening, Kari, the other contestants, and Anders spent the evening in the longhouse. Kari said that Anders, respecting her as a Völva, wanted her to take the high seat and perform her religious duties. The producers wanted the show to go another route. “They had us scattered in our seating and this was very awkward. Anders kept looking at me, expecting me to bless the mead and the meat,” Kari related to the packed house at Merlin’s Rest. “Anders handed me the horn of mead first and [one of the contestants] said ‘Oh, ladies first, huh?’ and I said ‘No, Völva‘s first, but of course no one else knew what that meant.” I understand that the producers are trying to go for entertaining, but if you are hosting an authentic Viking evening, why would you bar the Völva from her seat? It’s amazing to me that the producers could be so clueless about their own history and heritage. And disrespectful, too. Yet this was nothing compared to the final challenge Kari and her team faced. Since her team lost, they needed to take on an individual challenge, with the loser going home. First they shot arrows, to narrow it down to two. Kari and fellow contestant Maia didn’t win the arrow contest, so now they had to kill a chicken to see who was staying and who was going home. Kari told us they interviewed her on camera about if she would be willing to kill and animal and she said she would, under certain circumstances, “I said my grandmothers had done this and so I would do it as a way to connect to them, but I wanted to do so with prayer and in a respectful manner.” Animal sacrifice isn’t as popular to modern Heathens as it once was, but when Heathens do kill an animal it is to be done with the utmost respect and as humanely as possible. I’m not squeamish and I hate chickens, so the idea of killing a chicken didn’t bother me. But respectful? Time for prayer? Oh my, no. In both the video clips that followed and when Kari talked to us about what happened she radiated anger, shame, and pain. The contestants were to chase the chickens around for 20 seconds to get them wound up. Then they were to catch them, hit them with a stick until they were unconscious, and chop off their heads. And do this as fast as they could while the host and a comedian hired to add some color to the episode danced around, acting like fools. You do not frighten an animal and then beat it unconscious before killing it. WTF, Norway? This was as far from Heathen religious ideals as possible and my heart went out to Kari. It was apparent that she was angry, hurt, and felt pressured to act in a way that belittled her beliefs. Needless to say, she lost this contest and was sent home. The producers of the show, in ways large and small, showed a blatant disregard for religion and the religious ethics of the contestants throughout the series. They demonstrated a lack of respect and knowledge of their own history and customs. However, this episode was a train wreck to watch. Kari – I know you had an amazing experience overall, but I’m so sorry about what you went through in this episode. Knowing both Kari and the good folks at Gudvangen, being Ásatrú, and being specifically a Minnesotan of Norwegian descent this whole episode leaves a bad taste in my mouth. I found it distasteful enough that I wrote a letter of complaint to the local Norwegian Embassy here in Moscow (being my local office) with a cc to “Alt for Norge’s” network. Thanks for sharing your perspective Cara. Watching it online is uncomfortable enough. Watching it among others in public would have been exceptionally so. Thank you, Cara, for posting this. For the first time, I’m glad I work on Tuesday nights and haven’t been able to join the folks at Merlin’s Rest. My heart goes out to Kari, as well. But as I reflect on that, I am amazed at how what was a disrespectful act can be turned to strengthen threads of compassion and weave a web of Wyrd. I see Kari’s trial to hold true to her wisdom and to keep her heart in honor in the middle of thoughtless ignorance as the true Sacrifice. The community is strengthened by her sharing it with us; and the real traditions of the folk, ancestors and Gods are honored.